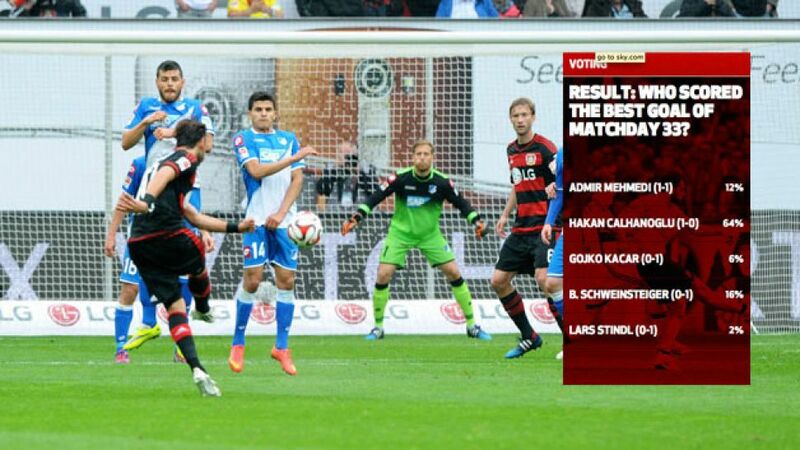 Cologne - In a weekend filled with jaw-dropping strikes, there was only ever going to be one winner of the Matchday 33 Goal of the Week vote: Bayer 04 Leverkusen midfielder . The 21-year-old struck for the eighth time this season, his sixth from a direct free kick, to score the all-important opener on the stroke of half-time at home to TSG 1899 Hoffenheim, paving the way for the Werkself to post a 2-0 victory. Calhanoglu had tested Hoffenheim keeper Oliver Baumann earlier in the match with a dangerous curling free-kick from 25-yards, but after the custodian kept that effort out, the Leverkusen No10 was evidently determined to make amends. In first-half stoppage-time, the Turkey international took aim with a set-piece from a whopping 40 yards out, before fizzing a vicious effort over the wall and into the net, earning a huge 64 per cent of this week's vote among bundesliga.com users. FC Bayern München midfielder Bastian Schweinsteiger took the silver medal (16 per cent) for his finish away to SC Freiburg, putting him just ahead of Freiburg's own Admir Mehmedi (12 per cent), who equalised for the Black Forest outfit with a 20-yard drive past Manuel Neuer. Hamburger SV's (six per cent) took fourth place for his well-placed header against VfB Stuttgart, leaving Hannover 96 playmaker Lars Stindl (two per cent) to round out the top five with his opener in Augsburg.